For many months now I've been using the King James Version of the bible in my daily devotionals. Beyond reading a passage here or there I don't believe I've ever read the KJV so thoroughly and closely. And it's been interesting. Here's one interesting thing. Did you know there are unicorns in the bible? It's both delightful and a bit startling to run across a unicorn when you are reading the bible. Translationally speaking, where did the unicorn come from? The Hebrew word in question is re’em (רֶאֵם). 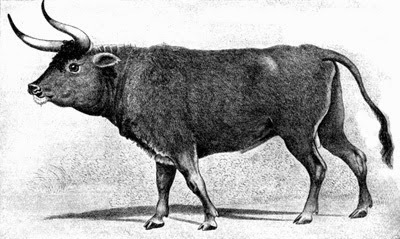 Re'em is believed to refer to aurochs (also called urus), an extinct form of wild cattle that was the ancestor of modern domesticated cattle. In the 4th Century AD St. Jerome translated the Greek Septuagint into Latin giving us the Latin Vulgate, which became the official bible of the Catholic Church. Encountering the Greek word monokeros ("one-horned") Jerome translated it with the Latin equivalent--unicornis. (From uni- ‘single’ + cornu ‘horn’). When the translators of the King James Version encountered the Latin word unicornis rather than translating the word they simply turned the Latin word into an English word. And that's how unicorns got into the bible. But more modern translations, knowing more about the re'em, tend to go with "wild ox" over "unicorn." Illustrative of the difficulty of sticking to a 'plain reading of scripture', when some ancient word forms and idioms are very difficult to define or understand, especially if only used in the Bible, and exaggerated still more if used less than 3 times. Hence debates about Romans 3 are valid, not just caving in to modern culture. Who knew? I'll need to read the Scriptures more closely in the future :) An interesting look at the history of Bible translations. Who knows what interesting words people will be discussing from today's translations five hundred years from now. And while the Bible is not just poetry, this does show us how its poetic nature resonates through time, never letting the literal, legalistic mind get too comfy, just as long as there are others, like many who comment on this blog, who sing the scriptures from their hearts. thanks! ripples across several layers of meaning, art, understanding! And here I thought they were probably rhinoceroses. Darn. That's hilarious! And then this reminds me why the KJV is not "the best" translation possible! My favorite engagement with the ancient aurochs was in the film "Beasts of the Southern Wild." Which, if you recall, I once did a sermon on, and leaned heavily on your material from "The Slavery of Death."